You'll never believe it......I've found another parrot, exactly a week after the last one!!! 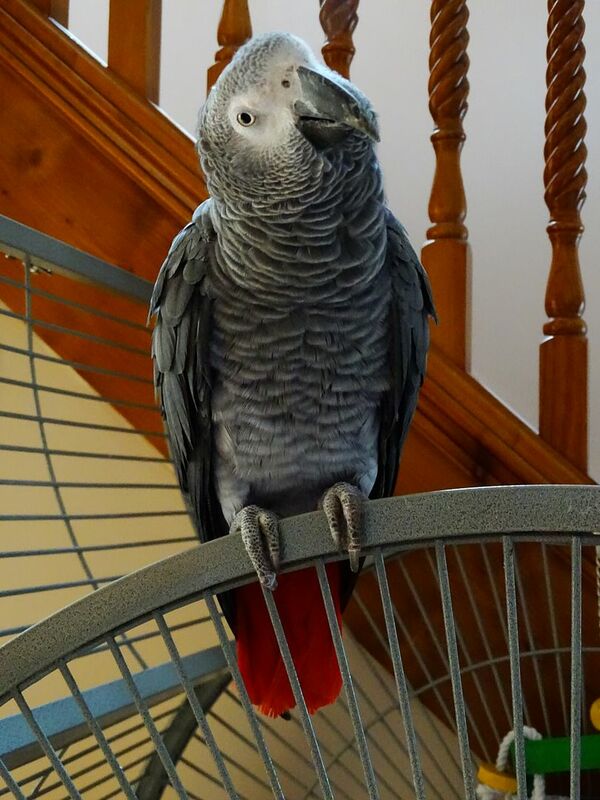 Anyway, parrot found, Boundary Road area of West Kirby, Wirral, healthy birdie, contact me on 07561518794 or 625 3449 if you think it's yours! Good on you 'birdie catcher', another little chick set for a happy ending. Have to confess I dived round to Margy's to meet this little birdie, what a little sweetie. Birdie was absolutely shattered and kept eating and sleeping, then had a little tickle before going back to sleep. Sleep safely little sweetie, Margy will get you home. Well done Margy, and Lexxi. Ha, Sue, Les came in at 6.30 (after having his phone off all day) gave him what for about not turning his phone on as have been trying to contact him since 12.00pm. He says why? so I said you'll see when you get in the house! So with a bit of trepidation he gets off the bike, comes in and said there's someone waiting for you in the front room, so he goes in and I heard 'hello' then he says is that Tats! See, told you she looked like Tats! so told him all about it and he really couldn't believe that 2 birds in one week have been stuck up a tree and come into the house! She's fast asleep in the bird room. She's eaten really well, gave her a piece of toast and she snatched it off me. She likes her cherries too good job I have a punnet in the fridge isn't it? Being dying to know Les' reaction. Surprise surprise!!!!!! It was lovely to see you and have a catch up. You know I said I'd put treats in all the cages before I came over, even Herbi's. Well, I moved Herbi's treat as soon as I came home but she wouldn't come out, still hasn't, won't go past the door (that hasn't got anything on it). Crazy bird, luv her. That's lovely Margy, its nice and safe with you. Hope you can find its home soon . Well, turns out that the grey that was here last week had got out again, the kids opened the window and out he went..again, the man came round this afternoon, just after I'd picked a cage up from Sue. He says to Hubby, I'm ashamed to say he's got out again! 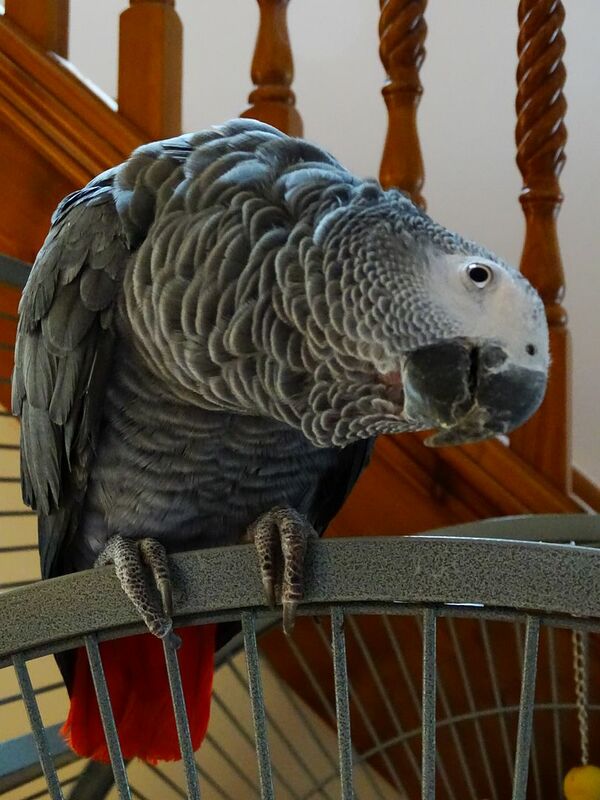 to which Les replies, it just so happens that I have an extra grey in my aviary! yes, the very same Smokey grey! What are the odds of it being the same birdie? No wonder he looked pleased to see me up in that tree! Anyway, after a long conversation with the owner, he asked if he could come and live with us! 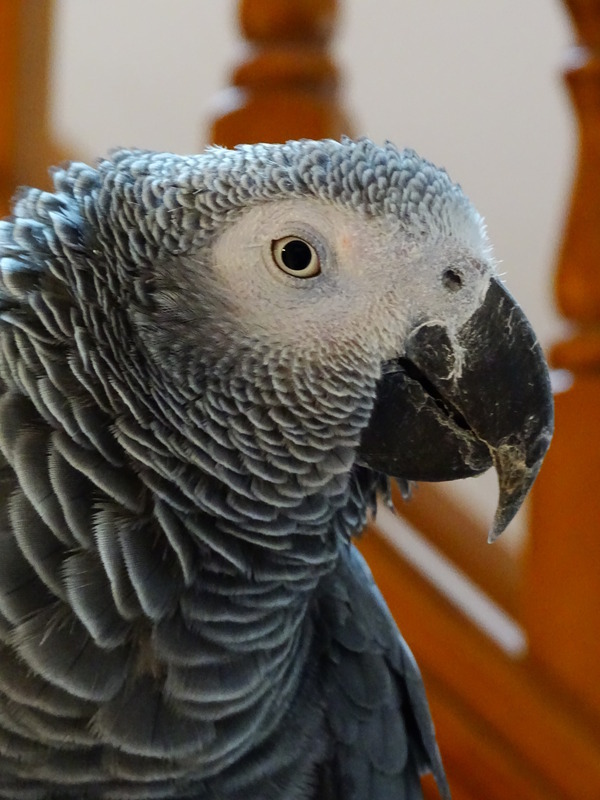 Not sure about that, and if we decide it's just not working with the other birds we will find a lovely home for Smokey. But must say, the galah's aren't bothered with him in the least, nor the Too's, the greys and Smokey had a good look at each other but so far so good. Tinkie caique on the other hand, well need I say more but then he goes for all the bigger birds so no change there. Poppi just came for a look! We'll see. O wow ho weird. So now he going to live with you he must of missed you. This must be the weirdest birdie rescue story ever It keeps making me chuckle. Seriously though, it may not have been third time lucky, poor little Smokey. Well this is Smokie, I think she's a girlie, though could be wrong, looks like she's beem left to her own devices for too long, won't step up onto hand or perch, eats nuts and bikkies with relish and apart from Cherries, refuses all other food, even toast, mind you she probably doesn't have the spread that we have and drops it. She's about 2 or coming up to 2 years old, talks like a lady, when she talks and seems to prefer ladies. early days yet but she is not really phased with the other birds, apart from the yelp we heard when les was supposed to be watching them.....think Harley grey went to investigate in the aviary. Likes to sit on top of her cage all day. She was in then aviary all day but didn't move far! Loves her shower. Not sure if she's staying yet, as I said early days! Margy she,s lovely and a lucky birdie. But looking at her I would say male. Do you Mandy? I thought girlie, but then am not so sure, but, both Harley and Roxxi aren't that bothered which does make me believe she's a girlie! but hey? we could both be wrong! The boys have a darker grey than the females in my experience but I might be wrong. A buety what ever m/f. Isn't she gorgeous, love that Grey look. I think girl, she's quite tiny like Kai and Kai is dark grey and a dna'd female. To me it's the Roxxi and Harley test, they were right about Aries who was tested the other week when she was chipped and is a little princess Harley gave her a kiss when they met.